Time for a dose of nostalgia. 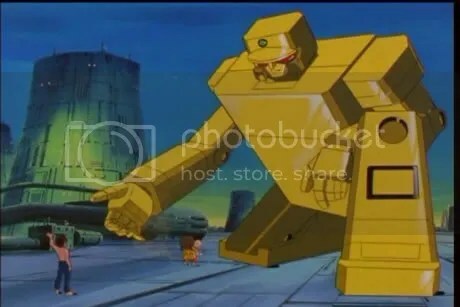 Golden Warrior Gold Lightan (黄金戦士ゴールド・ライタン), my favourite mecha anime when I was a wee lad growing up in the early 90s. Gold Lightan is a golden mecha shaped in the form of a lighter who can enlarge itself to combat giant enemy mecha. Gold Lightan and his mecha buddies are sentient and do not require pilots like Gundams. Most memorable is Gold Lightan’s trademark finishing move in which he stab into the enemy mecha’s body pulling out and smashing the enemy’s critical mechanism aka the heart. my childhood mecha anime was Zettai Muteki Raijinoh or best know as Lei Shen Wang in chinese. I didnt have hear about it til now. I loved Gold Lightan, though I actually only started watching it a few years ago during my ‘big classic mecha burger with cheese’ phase. I can’t wait to see him in tats-vs-com. my childhood mecha was the Timberwolf (Mad Cat to use the Clan name) from Battletech/Mechwarrior. PARTICLE PROJECTOR CANNON ftw. Mad Cat from Mechwarrior! O_O I miss that game! I remembered that i used to have a toy of that mecha! Too bad it’s lost now. when i was a kid, i thought that was a transformer. There is a couple that comes vaguely into my mind but there are 2 that I can remember as clear as day. finally someone who watched it as well! oh i never watch that one. thats alright. i wonder where i can get the DVD? i never watch that one as well. does malaysia show animes on TV? lost? too bad. it could be worth a lot now. it is a transformer, it transforms into a lighter. saw this show too during my primary sch days, if I’ve remembered correctly it was aired on weekdays ard 5-6pm slot. Watched Zettai Muteki Raijinoh which aired on Sat 2pm plus timeslot I believed and was great too, considering there were’nt much japanese anime available in singapore at that time. And the most unforgettable was Yoroiden-Samurai Troopers which aired on wkday morning at 5 or 5:30am slot -_- , where ppl attending sch in morning session could watch b4 leaving home. My first mecha anime was Legendary Brave Da Garn, loved it so much that I would rewatch it over and over again. Where can I watch this series? i remembered too when it aired on ch8 late afternoon in the 90s, can’t find the catchy mandarin version themed music when its transformation phase. I was digging around for this. Thanks!! Hey there! I’ve been reading your site for a while now and finally got the courage to go ahead and give you a shout out from Porter Tx! Just wanted to tell you keep up the great work!